One of the most important all-around talents of rock’s first fifteen years, succeeding in a variety of ways, from songwriter, bandleader to producer and A&R head of various record labels as well as being a highly regarded pianist, singer and hit-making artist in his own right. Paul Gayten was born in 1920 in New Orleans where 27 years later he lit the fuse that soon sparked rock ‘n’ roll, as his own ballad “True” became a national hit on the DeLuxe label that summer, as did “Since I Fell For You” by Annie Laurie who was backed by Gayten both on stage and in the studio. The success of those records (though neither one was close to rock styles) encouraged DeLuxe to sign more New Orleans artists when the opportunity presented itself, namely with Roy Brown whose “Good Rocking Tonight” late that summer launched rock ‘n’ roll. But it was almost Gayten who did so first, as the flip side to “True” had been a rocking song called “Your Hands Ain’t Clean” that more than hinted at what was around the corner musically. Though proficient in other styles, Gayten went on to release his most influential and popular records in the rock realm, as well as continuing to back Laurie, who achieved notable success as a rock artist herself over the years. Soon another of the artists he championed, Larry Darnell, became a star in his own right cutting songs written and backed by Gayten. 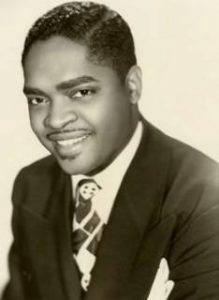 Gayten’s versatility made him invaluable to the various labels he recorded for over the years, among them Regal, OKeh and Chess, the latter of whom made him an A&R chief, a rare position for a black man in the 1950’s. He’s credited with discovering or nurturing a number of fairly prominent artists, among them Clarence “Frogman” Henry and Bobby Charles, writing some classic sides and playing on a multitude of hit records by other acts. His own records were selling less by this point, but among them were a handful of instrumentals that remain highly valued among rock aficionados. By the early 1960’s he’d moved to Los Angeles and continued working for Chess but eventually started his own small label and gradually faded from the scene. Of all of the early jack-of-all-trades in rock, Gayten may be least remembered, but his impact was incredibly diverse. He died in 1991 at the age of 71. As sideman… behind Annie Laurie. As sideman… behind Chubby Newsom. As sideman… behind Mr. Google Eyes. As sideman… behind Larry Darnell.